The Paris of South America has been affectionately attributed to Buenos Aires, the capital city of Argentina. And after a few days there, you’ll begin to see how truly beautiful and mesmerizing Argentina can be. With a predominance of second and third generation Italian and Spanish decedents, Argentina isn’t your regular South American cup of tea. Throw Italy, New York, Spain, and France into a blender and you’ll get something consistent with Buenos Aires. Oh, and garnish with Brooklyn. Whether visiting or moving to Argentina, you’ll eventually have to deal with the matter of: How to Make Friends in Buenos Aires. Though Argentines are known for their friendliness and warm hearts, they can also be a little standoffish to newcomers. This is why, along with great travel and cultural information on how to get around in Argentina, I’ve also laid out some ways to make friends while in Argentina. 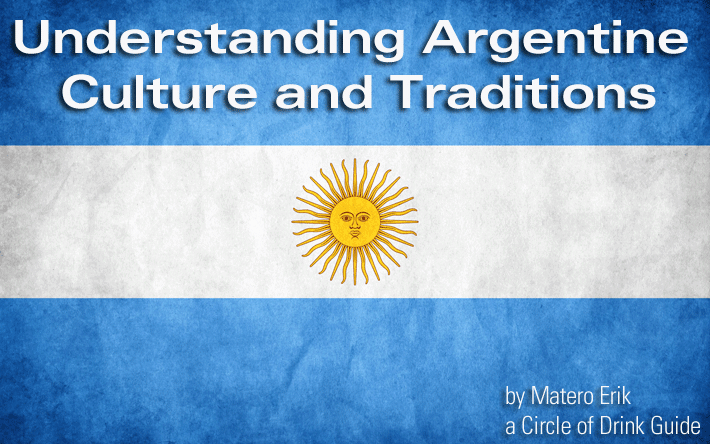 And you may not expect that a single herb called yerba mate could help you assimilate into Argentine culture. But more on that later. Argentina is an incredible country that has something to offer everyone. From the tropical rain forests of its far North, the deserts and grasslands of the interior, to the cold and beautiful Southern tip, Argentina is stunning and diverse. Culture abounds in the cosmopolitan capital city of Buenos Aires (Spanish for fair winds). In the interior, quaint villages and larger cities are replete with Spanish Colonial flavor. With no lack of animal life, mountains, lakes, and rivers, the outdoor enthusiast will appreciate all the possible adventures the country has to offer. When deciding to go to Argentina it’s important to know what the weather is going to be upon arrival and beyond. Since Argentina is located in the Southern Hemisphere, the seasons are opposite those of the Northern Hemisphere. For example, you can leave New York City in the middle of a snowstorm in early January and find yourself in Buenos Aires the next day with a high of 86ºF (30ºC)—and don’t get me started on the insanely humid summers. So make sure you check the weather beforehand. Argentina is an extremely large country (7th largest in the world) with an Amazon Rainforest to the North, the cold Antarctic-like region of Patagonia to the South, and every possible climate in between. No matter what season you choose to visit Argentina, if you are going to be traveling within the country, be sure to pack for the change in climates. If you’re a citizen of the United States, Canada, New Zealand, South Africa, or the United Kingdom, you only need a valid passport to receive a 90 day tourist visa. You can avoid this entrance tax by entering Argentina through any other point of entry. Argentina is generally a safe country to visit in terms of disease, as no vaccines are required for entry. However, caution should be taken when traveling to the tropical destinations. Here is a link to additional information on health in Argentina. While in Argentina, you’ll have little trouble accessing an ATM in the big cities or any of the resorts and tourist spots. In some cases, you may be charged a fee from both your bank and the ATM’s bank. Avoid this by finding the same bank you used back home (if possible). Inflation is a problem and the Argentine government has been limiting capital flow out of the country. As a result, ATMs only give out Argentinian Pesos. To get the most of your money while exchanging dollars for pesos, make sure to use a reputable bank such as the Bank of Argentina at the airport (EZE) in Buenos Aires. And if you’re feeling adventurous, you can obtain an even higher exchange rate on the “blue” market (the black market of Buenos Aires). Though, be careful, as there is no shortage of unscrupulous Exchangers that won’t think twice to rip-off green tourists. In Buenos Aires, Avenue Córdoba, Florida, and 9th Ave have reputable locations. No one knows a country like the people who live there. With that said, the best way to know a country is to know the people that live there. This means that you need to try — and I can’t stress this point enough — to make friends with the locals as soon as possible! When people think Argentina, terms such as: great beef, Tango, and futbol (soccer) come to mind. While all of these are intricately connected with the country, there is one that is arguably the most important. So important, that is has been declared a National Treasure. Before the first cows arrived, the first soccer ball was kicked, and el Tango was developed on the streets of Buenos Aires, the native Guarani Indians were consuming what they called the “Drink of the Gods”, known today as yerba mate (pronounced yer-BAH MAH-tay). Healthy, nutritious, and insanely delicious, this tea-like infusion from the leaves of a South American Holly tree provides vital nutrients, energy, and mental clarity to the drinker. Equally, it acts as a social lubricant, allowing you to connect to anyone it’s shared with—family, friends, and complete strangers (in this case, you are the stranger). What better way for the traveler to plug themselves deeper into pulse of Argentine society, than by learning to drink and share yerba mate. To avoid confusion and unsightly cultural faux-pas, it is essential that you learn about yerba mate BEFORE you go. A working knowledge of Castellano (Spanish) is going to help you, not only with travelling around Argentina, but making friends that are going to show you the Argentina most foreigners never know (focus on the principal verbs such as: tener, comer, venir, salir, hacer, estar, and ir). If you really want to stand out, learn some of the local slang. The book “Che Boludo!” is the best guide. El mate: The cup that the infusion is drunk from, often a gourd. La bombilla (pronounced bom-BEE-yah): Traditional metal straw, with a filter on one end, that is used to drink the infusion from the gourd. La yerba (pronounced yer-BAH): The actual leaves used to brew the infusion. These three components are also often referred to as “mate”, a singular unit, as in “Vamos a preparar un mate” (Let’s make some mate). Las hojas (pronounced OO-has): the leaves of the mate tree. Los palos (pronounced PAH-lows): the small twigs that are present in the mate. The ratio of these three components vary regionally. Together, they make up the cut of the mate (as described in the yerba mate book, Mateology ). The cut is the composition of the blended proportions of leaves, twigs, and powder ( learn more here). The Argentine Cut of mate, what you will most likely be drinking in Argentina, contains broad cut leaves, relatively small amounts of powder, and small to large twigs. El Cebador (pronounced say-bah-DOOR): Meaning the Mate Brewer (or Mate Server); this is the person who will regulate the mate ceremony. Lavado (pronounced lah-vah-DOH): Once the yerba has lost its flavor, it has become “washed”. Time for some new yerba. What is a Yerba Mate Ceremony? The Mate Ceremony (I call it a “Mate Circle”), as Dave “Mate” Askaripour describes in his book Mateology, is the opposite of being in a club. This is an intimate setting for friends and strangers to think, connect, and dissolve barriers as minds and hearts coalesce. The Cebador is the host of the Mate Circle. He or she will be responsible for preparing the mate gourd and serving each member of the Circle. There is a ritual to the whole process. The Cebador will drink the first couple of gourds to ensure that he or she is satisfied with the taste and quality of the mate. Considering placement of bombilla, temperature of water, etc. The Cebador will fill the gourd with hot water (never boiling water) and pass it to the to his or her right. Whomever receives the mate gourd, drinks until an audible suction (slurp! slurp!) is heard, signaling that they have finished their entire gourd of mate. This is considered polite. This person will then hand the gourd back to the Cebador, who will then refill the gourd and pass it to the next person to the right. Everyone will drink before the Cebador drinks his next gourd. This process will continue until the mate becomes lavado (tasteless). More mate will be prepared or the drinking will stop. You’ll be sipping on the same metal straw (bombilla) with many other people. Do Not move the bombilla around. It’s where it is for a reason (to prevent clogging—learn more here). Please REFRAIN from touching the tip of the bombilla with your tongue. Check out these videos on the Mate Circle and how to properly prepare a mate gourd. Passed down from its strongly-steeped European heritage, most North American and EU travelers are going to have an easy time adjusting to the flow of things in Argentina. Nevertheless, the shamelessly late-night dinners (10:30 PM), intense all-nighters, and generally slower pace of life (think Southern Europe with siestas) might be unusual at first. When greeting someone for the first time, the nth time, and when saying your goodbyes, it’s customary to give a single kiss to everyone present. Whether this is exciting or uncomfortable, you’ll soon become acclimated to the custom and appreciate how this friendly greeting instantly dissolves peoples’ facades and barriers. Although more and more common, public drunkenness isn’t the norm in Argentina. Do your country of origin and yourself a solid and comport yourself well. Easy to get to, Buenos Aires is a great jumping-off place to begin your travels in Argentina, on to other provinces or neighboring countries. Founded by the Spanish in the 16th Century, Buenos Aires became the center of the newly created country of Argentina in 1816. In the 1850’s, large waves of European immigrants flooded Buenos Aires, creating a distinctly European culture and traditions that continue to this day. Buenos Aires is home to the the first subway system, “el subte” (subterraneo), as it is known locally, in South America. It’s one of the best ways to get around the city (assuming there isn’t an ongoing strike, which can happen quite frequently). The bus system (buses are called “colectivos” or “bondis”) is a little more daunting to use, but is manageable with a little effort. There are numerous taxis roaming the streets looking for passengers as well (select only the ones that say “Radio Taxi” and try to pay with exact change to avoid being ripped off). Either transportation method will get you anywhere in the city. This is an upper-middle-class neighborhood nestled between Palermo and Recoleta (some maps include it as part of Recoleta). Many bars, nightclubs, and restaurants line the main strip of Sante Fe. This neighborhood is easy to access on the subway system. The trendiest neighborhood with some of the best nightlife in Buenos Aires is filled with Old World charm. The largest barrio in Buenos Aires, it is dissected by the Avenida Juan B. Justo into two main sub-neighborhoods: Palermo Soho and Hollywood. Palermo Soho is lined with unique cafes, designer boutique clothing stores, a few Mexican spots, chic bars and clubs, and fancy restaurants. The Plaza Serrano (Plaza Cortazar) hosts an excellent street fair during the weekends. You will find some of the highest concentrations of North Americans and Europeans frequenting the bars that encompass the plaza. Palermo Hollywood is named for its high concentration of TV and film production studios. Not as glamourous by day as Palermo Soho, nights and weekends are packed with moving crowds circulating between restaurants, bars, and clubs (called boliches) on Gorriti street. Some of the biggest clubs and concert venues are located near the railroad tracks. Quite affluent — and more of an Old Money feel — the beautiful homes and excellent shopping make Belgrano a prime area to take a stroll on its cobblestone streets and through its numerous green spaces. Shopping is great on the Avenida Cabildo where you can find shoes and clothing from chain or smaller independent stores. There’s an eclectic mixture of bars and restaurants in this area. The Barrio Chino (China Town) is also located here, making Belgrano one of the biggest alternative food destinations in the city. For vegans, vegetarians, and health conscious travelers in Buenos Aires, Barrio China is the spot for tofu, seitan, and other healthy products. The newest and most modern area of Buenos Aires, the high-rise buildings and well-planned streets will remind you of a modern American city. With Microsoft, IMB, and other tech giants towering into the skyline, the North American influence of the zone is palpable. Located right by the Nature Reserve (La Reserva Ecologica) on the water, a bridge connects it to the rest of the city. High levels of security (mostly from the several military and naval bases in the area) give the zone a safe feel. And the high priced restaurants and clubs only add to its exclusiveness. High-end designer shops, incredible historic architecture, and the beautiful Recoleta Cemetery (site of Evita’s grave) surrounded by a high wall, making Recoleta a unique district of the city. The affluence found here is pronounced, with seemingly limitless bars and nightclubs constantly adding to the luxuriousness of Recoleta Village. Parisian style, for a high price. Unfortunately, taxis are the best way to get around this barrio. This is the “Upper East Side” of the city. Known by some as the “Republic of San Telmo”, this historic neighborhood is lined with cobblestone streets, elegant low rise houses, and the true bohemian culture of the city. One of the contenders for the coveted title of the “Birthplace of the Tango”, (the other being the close-by Boca neighborhood) this neighborhood can boast the famous San Telmo Market that sells traditional wares along with numerous Tango street performers (hint: Plaza Dorrego, located in San Telmo, one of the best areas of the city to get a traditional mate gourd and bombilla). It has been changing with an influx of wealthier newcomers that’ve led to an outcry of long-standing residents against the “Palermo-fictation” of the storied neighborhood. Plenty of bars hug the streets, representing different waves of immigration over the centuries. This district contains the imposing Congress building of Argentina. Surrounded by other grand historic buildings, the Plazo del Congreso offers impressive views of the capitol building and 19th Century architecture at its finest. Although it seems a little sketchy at night with lots of homeless people, improved security has brought more tourism and hotels to the blocks surrounding the Plaza Del Congreso. Expect to find many language schools in this area, if you’re seeking to learn Castellano. Following the Avenida de Mayo from the Plaza del Congreso to its eastern terminus, you’ll find yourself in the Plaza de Mayo, looking at the Casa Rosada (the Argentine equivalent of the White House in the US), home of the Argentinian President. Just next door to San Telmo is the colorful neighborhood of Boca. A rough, working-class area where, in the past, the majority of the residents worked in the docks and shipyards. The barrio’s two main attractions are the “La Bombonera” soccer stadium of the Boca Juniors soccer team and the Caminito, or ‘Little Street”, which is an artist’s street lined with brightly colored houses often made with corrugated metal sheets. Get your camera ready. The area has become quite a tourist destination, and because of the dangerous nature of the neighborhood (especially after dark), it’s strongly encouraged to stay within the strict barriers that have been put up by the police. After dark, be sure sure travel by taxi. This gritty and unapologetically loud and bright neighborhood is truly the “East Village” of Buenos Aires. The high concentration of internet cafes, hostels, and hotels make this the to-go place for those travelers who don’t have their plans or accommodations quite figured out. Microcentro a great place to catch a concert or show. There are no lack of good shopping places and the plentiful subway lines that run through here make it easy to get to and from anywhere in the city. Buenos Aires’ Obelisk stands at the intersection of the Avenida Corrientes and the Avenida 9 de Julio, the latter being the world’s widest at seven lanes in each direction and impossible to cross in one attempt. Buenos Aires is home to two world famous soccer clubs: River Plate (CARP) and Boca Juniors (CABJ), known simply as Boca and River. The rivalry of these teams is matched only by that of Real Madrid and FC Barcelona in Spain. The matches between the two are known as “Superclásicos”, meaning that every game played between the two is an instant classic. River’s colors are red and white, Boca’s are blue and yellow—colors that you’ll see all over the city. I remember reading a newspaper article there entitled, “Boca vs. River Increases Heart Attacks”. This just goes to show the insane following that both of these teams have. If you’re able to make one of these superclasicos, it will be something you won’t soon forget. Argentina is a huge country with plenty to offer, so don’t be afraid to get outside of Buenos Aires, even if it’s for a quick day or weekend excursion. Some time enjoying the surrounding areas will be a relaxing way to take a break from the fast pace of the city. Just north of Buenos Aires on the Rio Plate, Tigre is the most popular day excursion from the capital and is reached easily by train from Retiro station (duration: 1–1.5 hours). A popular vacation and gambling destination in the early 20th century, Tigre is home to many canals and rowing clubs. You can take a ride on a boat or a party boat if you are feeling slightly more festive. Enjoy eating at many of the fine restaurants on the streets facing the water. There are plenty of interesting museums to see including the National Naval Museum and the world’s only yerba mate museum — El Museo Del Mate — which is a must for anyone looking to understand the history of the national drink of Argentina, Uruguay, and Paraguay. There’s also a theme park and casino in Tigre. Located just across the murky water from Buenos Aires is a fellow Rioplatense neighbor, Uruguay. One of the most liberal South American nations, recreational marijuana use was legalized for adults just recently (as of late 2013). Apart from that, Uruguay offers two great day trips from Buenos Aires. Colonia is a Portuguese colonial town that is now a UNESCO World Heritage site and has the quaint charm of the older parts of Lisbon. Beautiful cobblestone streets and hotels abound in the city. Both cities can be reached by ferry from Puerto Madero in Buenos Aires. Famously known as top summer spot for Argentineans, this Uruguayan town has become a new favorite of American and European travelers. Gorgeous beaches combine with great nightlife — that starts well after a late night dinner — to create an unforgettable getaway atmosphere. Take the ferry from Buenos Aires to Colonia or Montevideo, then hop a modern bus to Punte del Este. The whole trip will take around 6 hours. The biggest waterfalls in South America, Iguazu Falls will not fail to impress you by its power and beauty. December to February, as well as Easter week, is the big tourist season. From Buenos Aires you have a couple of options to get there: The first is by airplane, which is the most expensive way (and quickest). LAN Airlines and Aeriolineas Argentinas offer flights. The second method is by bus. The trip takes 16–18 hours but is much cheaper than a flight. The buses are comfortable, provide movies and food, and are a great way to see the countryside. Via Bariloche and Andesmar are the best long distance bus companies in Argentina. As the falls are located on the border of Argentina and Brazil, it will be tempting for travelers to want to explore Brazil. Keep in mind that Americans will have had to obtain a travel visa BEFORE leaving the US in order to cross into Brazil. Mendoza is one of Argentina’s largest cities and home of the growing Argentine wine industry. Malbec is the predominant grape of the region. Located in the midwest of the country, between the Pampas and the Andes mountains, this dry, mountainous region is home to numerous vineyards. Take a tour of a winery and enjoy everything that a sophisticated and modern city such as Mendoza has to offer. The area has great opportunities to enjoy nature with hiking, skiing, and whitewater rafting. Mendoza has strong historical ties to Chile, so don’t be surprised at the differences from Buenos Aires. Even the Spanish spoken mirrors a Chilean accent more than that of Buenos Aires. Bus is the best option to get from Buenos Aires to Mendoza. Here is a good site to book all your bus trips in Argentina. Whether you are in the streets of Buenos Aires, on a ferry to Uruguay, or on a long distance bus ride to Mendoza, one thing is going to remain constant: yerba mate. This traditional drink is going to be your key when introducing yourself, making new friends, and just being an all-around nice person when you offer mate to someone sitting next to you on that long bus ride. As with all things, the more you prepare for something, the easier it will be for you later on. So learn all you can about this wonderful gateway drink to Argentine culture before you go. Try different types of mate, buy a gourd and bombilla, and learn how to use them. Learning the customs of country is the ultimate sign of respect and admiration for its people and traditions. And who knows, you may even be able to teach them something about yerba mate. The first Mate Circle of 2014 was a success! Thanks to everyone that joined in from around the world to learn and share about this magical herb from South America that we all love. We had Materos from The US, Canada, Norway, England, and Poland. Each with their own story, questions, and experiences to share with the Circle. Dave Mate and Matero Erik fielded questions about different types of bombillas, gourds, and how to prepare mate. Other Materos chimed in about hemisphere switching and flooding their mate. Matero Erik went briefly over the history of yerba mate: from its roots with Guaraní people, its first commercial cultivation by Jesuit missionaries, up to today, as mate being an integral part of the daily lives of millions of South Americans. And remember: Yerba Mate history is being made every time one of these Circles are held! So make sure to join us each week by subscribing to our facebook page where we list the schedule. Many of us know the incredible health benefits that yerba mate has to offer. This was discussed in greater detail. An excellent question about the nutrient extraction from yerba mate and the nutrient absorption in the human body was brought up by one of the Materos in the circle, something that we are going to look into! As far as the social benefits, being able to talk with people passionate about yerba mate from around the world was evidence enough of the social benefits it has to offer! Many excellent questions were asked by Materos of all experience levels. We were even fortunate enough to have some people brand new to the holy holly herb wondering if yerba mate would help them to study for their exams. The answer? YES! It is one thing to read about what mate can do for you, but to have Materos from around the world tell you from first hand experience what it can do is a wholenother level. So you want to know where you can buy yerba mate in San Diego? No worries! We got you covered. Whether you’re seeking a few local spots to purchase organic yerba mate or if you’d like to shop for yerba mate online, we’ll provide you with all the options you need to get started drinking the holy holly herb of yerba mate. It’s an all too common experience: I introduce yerba mate to one of my friends, they love it, but, they have no idea where to get it! So enjoy this short guide showing where to buy yerba mate in San Diego. Most organic grocery stores like Whole Foods will have some selection of bagged and loose leaf yerba mate, but like craft beer and specialty coffee, it’s often the small boutique tea shops that’ll carry the most high quality, organic yerba mate. Like with any type of food or drink, the more you know how it was grown, processed, and stored, the more informed your decision will be when deciding what to buy. Yerba mate is no exception. Commercial mate farms, like any other big agricultural operation, often use pesticides and fertilizers to produce crops as fast as possible. Choosing an organic yerba mate helps you minimize your exposure to harmful chemicals. Another important consideration is whether to buy smoked or non-smoked yerba mate. In the smoking process, high temperatures are applied to roast the mate (increasing the PAH levels—learn more about that here). Any burning of organic material will increase the carcinogenic potential (think smoking). Why drink yerba mate instead of green tea or coffee? Everyone knows that green tea is incredibly healthy for you. You may be surprised to know that yerba mate is kind of like green tea… on steroids. Maybe even organic steroids. Of the 196 active compounds that yerba mate contains, green tea can only boast 144. Coffee is extremely delicious. As someone who worked in specialty coffee there is nothing more exhilarating than exploring the flavors of an amazing espresso or pour over. However, coffee is extremely acidic. Drinking too much coffee can disrupt our body’s pH balance, which in turn can leave us susceptible to diseases that thrive in acidic environments (i.e., cancer). If you aren’t able to find local organic yerba mate that suits your taste in your area, consider taking a look at our online yerba mate shop. Circle of Drink (COD), established in 2011, is an online retailer of everything yerba mate. We proudly call ourselves Materos, the name used to describe insanely passionate yerba mate drinkers that take on the Mate Lifestyle of a healthy mind, body, soul, and community. South America has embraced the Matero Lifestyle for many generations, with mate being a stable drink that forms bonds and friendships everyday. With numerous video tutorials, articles, and access to online communities of avid mate drinkers from all around the world, COD is at the forefront of the coming Yerba Mate Revolution in North America and beyond. Education, Health, and Community are at the core of our mission and we continually follow mate’s developing story — from new scientific studies about mate’s health benefits to the social benefits of mate consumption — bringing everything together for you in one place. The Internet is an amazing resource to find new brands and blends of yerba mate as well as getting your hands on all of the necessary equipment to drink mate with the traditional gourd and bombilla. Luckily, COD has you covered with complete yerba mate kits as well as samplers so you can discover your taste for yerba mate. Save 5% on your first purchase using your city code “SanDiego5” at checkout. Yerba mate is best when shared with other people. Your family, friends — even strangers! If you decide to drink mate the traditional way, you can bet that folks are going to ask what the heck you’re up to! With that strange cup and weird metal straw. No worries. We’ve been there. Many a people have been quite perplexed by such an assemblage. But little do they know that it’s one of the coolest ways to drink yerba mate. Here’s a video introducing you to drinking yerba mate the traditional way. So live a little! See what yerba mate can do for your social life by connecting with our online communities on facebook, youtube, instagram, and twitter. Visiting New York? No problem. We’ll also ship you yerba mate (it’ll only take 1–2 days!) while you’re here. Welcome to The Official Yerba Mate Buying Guide, where you’ll easily learn everything you need to buy yerba mate and start drinking like a True Mate Drinker, also known as a Matero (pronounced MAH-ter-ROW). Maybe you’ve just heard about Yerba Mate, maybe you’re still asking “what is yerba mate?,” or maybe you have had some experience with this incredible herb from South America. Regardless of your experience, this is a quick, but comprehensive guide that’ll give you the confidence to properly purchase the right equipment (mateware) and Yerba Mate that’s perfect for you. Soon you’ll know everything from organic Yerba Mate to mate gourds and the differences between yerba mate straws called bombillas. So sit back and scroll through the information below. If you have some mate already prepared, take a few sips and enjoy. Our yerba mate guide is going to help you get the most out of the immense health and social benefits Yerba Mate has to offer. Here are a few videos to introduce you to the world of Yerba Mate. You’ll learn just how healthy yerba mate is and the social benefits that it provides. To keep things simple, the receptacle is commonly referred to as a gourd, even if it isn’t an actual gourd (i.e., glass, wood, aluminum). Drinking Yerba Mate with the gourd and bombilla is the best way to maximize the health benefits, as the nutrients can be fully extracted with repeated steepings. Additionally, the added agitation from the sucking action of the bombilla aids in reaping its health benefits. Plus, it just looks cool to drink with a gourd and bombilla. The gourd is essentially a variety of squash, similar to a butternut or summer variety, that has been hollowed and dried. The cut end of the gourd is tapered, forming a natural rim to rest your mate bombilla (straw) on. Each type of gourd has its own unique personality which may differ in functionality and ease of use. Your lifestyle and needs will dictate the type of gourd that will best suit you. Whether it’s a glass gourd that’s easy to clean or a calabash gourd that’s as traditional as it gets, there are many types to choose from. Below I will describe each type and offer some pros and cons to illustrate the differences. Easy to use and versatile, wooden mate gourds offer an attractive way to drink mate. They’re usually made from palo santo (holy stick) or algarrobo (carob) trees. Not as common, but some are made from Coastal Spanish Cedar, as our handcrafted Quantum Cups. Palo santo wood is very dense and heavy; it’s durable and sturdy. It imparts a faint piney flavor on the mate. Carob is significantly lighter and has a reddish hue. This is a sleek, modern interpretation of the mate gourd. The interior is made of thick tempered glass which ensures that you are tasting only the yerba mate. On the exterior, a comfortable leather envelops the gourd making it easy to hold and not too hot to handle. Metal and silicon are other materials being used for modern gourds. Now that you have chosen the mate gourd that is right for you, there are some things you need to know to keep your gourd in proper working order. With the right maintenance, your gourd will last years. The organic nature of the calabash and wooden gourds means that they will impart their own flavor. Curing your gourds will soften this flavor by creating a yerba mate “taste memory”. Whether you have a calabash or a wooden mate gourd (algarrobo wood), the curing process is essentially the same. However, you’ll want to gently scrape out excess organic material from the bottom of the calabash gourd (without compromising its watertight integrity, of course) before and after curing. Fill your gourd to 3/4s capacity, preferably using a Gaucho cut (without palos). Let the gourd sit overnight. In the morning repeat the process (you don’t have to wash out the gourd again). Add fresh yerba, then add properly heated water, and let it sit for another 12 hours. The entire process will take approximately a full day with two, 12-hour soaking periods. If time is short, you may opt to let the gourd cure for 24 hours straight, without making the change after 12 hours (which is also acceptable). Just make sure to add more water every several hours as it’s absorbed by the gourd. If you’re using a hard wooden gourd such as palo santo or lignam vitae, we recommend NOT curing the gourd. You’ll need to use the slow cure method we’ve developed. Allow a 24-hour (min.) resting period after each full day of use for the first 6 months. This will slowly cure the gourd over time, allowing the moisture content to leave the gourd. If you cure it the traditional way, you run the risk of the wood absorbing too much water and eventually cracking. Ironically, it’s best to cure only the softer woods as the harder ones are, initially, more susceptible to cracking. There is nothing as shocking and depressing like waking up one day, all excited to drink mate, only to discover an unwanted colony of mold thriving in your mate chalace. Sayyy whaattt..!! A Matero’s nightmare! Keep your gourd clean and dry. Drinking yerba mate creates the perfect environment for mold to grow — warm, wet, and dark. By cleaning out your gourd after each use and letting it dry on its side, you hamper the growth of mold. Lets say that, hypothetically speaking, you forgot to keep your gourd clean and dry between uses and now it is all green and moldy inside. Are you going to have to throw it away and buy a new one? No! Fill your (moldy) gourd with boiling water and let sit for approximately 25 minutes. Pour out the water and let it dry for 2–3 days — you want it bone-dry. This should take care of your problem. Remember: Never use soap to wash your calabash gourd. A slight hint of dish soap is never a tasting note you want in your mate. We recommend that you roll with an entourage of 2–3 gourds. This way there is ample time for each to rest and completely dry between uses, ensuring that you always have a clean and dry gourd “sin moho” (without mold)! 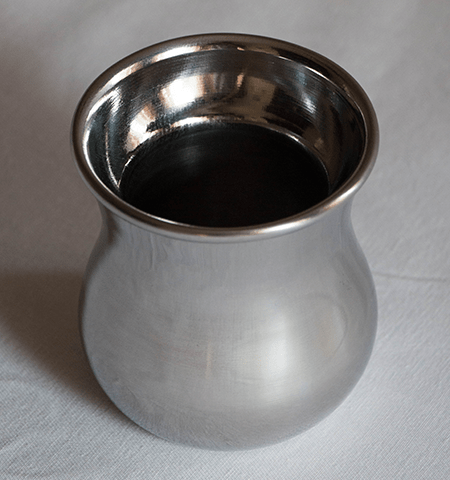 In order to properly drink yerba mate in the traditional manner you need to get a bombilla (pronounced bom-BEE-sha or bom-BEE-yah). It literally means “straw” in Castellano (Spanish) and is used to — you guessed it — drink the hot water infused with the goodness of yerba mate. The bottom of the bombilla contains one of many types of filters, preventing the yerba mate from entering your mouth. Yerba Mate bombillas come in all sorts of sizes and filter mechanisms. The various types were developed for specific yerba mate cuts (discussed shortly) and gourd styles. This elegant and stylish bombilla is made from high quality alpaca silver (also called German Silver and Nickel Silver). At 7.5˝ long and 1 cm wide, it works well with most gourds and cuts of mate. It’s a great all-around bombilla. The filter is spoon shaped with fine holes that provide reliable filtration. Our Simone bombilla is our latest addition to our spoon bombillas. Chrome-plated and donning a slick brass spout, it’s a solid bombilla for any cut of mate, especially those powdery Brazilian/Gaucho varieties. As the name implies, there is more going on here. A combination of pinholes and a compressible spring provide twice the amount of filtration with this double action bombilla. Like your gourd, your bombilla needs to be kept in good working order. Over time, the inside of your bombilla can be completely clogged by layers of organic material that are left behind when drinking mate. To prevent this from happening, we recommend a simple technique that will keep your bombilla clean and clear of any blockages. If you’re using a bombilla made from alpaca silver, which is significantly softer than stainless steel, take extra precaution not to use it for scraping lavado (tasteless) yerba from your gourd, lest it becomes worn and discolored. The regional cuts each have a different make-up of these elements, resulting from the processing methods of the mate. Cuts are also determined by the philosophy of each mate producer. Some believe that adding stems dilute the mates; others believe that they are absolutely necessary, adding a natural sweetness to the yerba. These different cuts allow each yerba mate to have its own unique character and style, just as wine has many textures, levels of roundness, and body. Seasoned mate drinkers learn how to appreciate the various nuances between all yerba mate cuts over time. Our Mission Organic Yerba Mate is a good example. This cut makes for a smooth, medium body mate. Our Galaxy Yerba Mate is a good example. This cut creates a dusty mate that has a strong, malty, robust flavor. Full body. The Paraguayan Cut is unique. It shows hybrid characteristics between Argentine and Gaucho cuts of yerba mate. Popular in Paraguay, it is also very common to be aged for 2–3 years, giving it a unique floral and sour taste profile. Mate grown in Paraguay has a signature sourness and slight tartness, with complex flavors of cherry, tobacco, chocolate, and vanilla. For someone only accustomed to Argentine yerba, trying it will add another level to your mate experience. Our Ascension Organic Yerba Mate is a good example. The floral, smooth, and sometimes robust and earthy tones make for a unique experience. Light to medium body. While drinking yerba mate with a gourd and bombilla is the best way to get the full mate experience, we understand that preparing the traditional gourd isn’t always going to be the most convenient option. Some people may be intimidated by such an elaborate process or simply don’t like the strong taste of mate from a gourd. No problem. Truth be told, not many people started drinking coffee with straight espresso — it’s something that most have to learn to appreciate. Luckily, Yerba Mate is versatile enough to shine in many ways. Traditionally a way to make coffee, the french press is a quick and easy way to make a lot of Yerba Mate. You’ll notice a lighter, more nuanced beverage when brewing Yerba Mate without a gourd and bombilla. Brewing in a teapot is as easy as french press. Most modern teapots come with a detachable strainer inside. If yours doesn’t, any standard cooking strainer should do. Is there anything more convenient and transportable than a yerba mate tea bag? Not really. So it’s good news that Yerba Mate can be deliciously made with tea bags. Great for drinking yerba mate in college or work environment We offer a wide selection of yerba mate tea bags. So Now You’re Ready to Begin Drinking Yerba Mate — Yes Indeed! These are fundamental building blocks of your yerba mate experience upon which you are going to start accumulating more knowledge. Some of it you’ll read about in other articles and videos — perhaps from our yerba mate book, Mateology — but most of it will come from personal experience or from the person sitting next to you in the Mate Circle. Every day, millions of people around the world enjoy sipping on mate by themselves, but what we want to make clear is that yerba mate is a social drink: It’s the Drink of Friendship. Yes, the health benefits are incredible. But forming friendships, sharing something so personal as a straw with complete strangers — this is what makes yerba mate magical. Salud! And welcome to the wonderful world of yerba mate.